Living organisms are made up of mostly water and carbon based molecules. Each carbon atom is able to form four bonds, meaning it is the perfect element to make larger structures, also called organic molecules. They are broken into four basic groups: carbohydrates, lipids, proteins, and nucleic acids. Nucleic acids are a more complex group, partly made up of carbohydrates, responsible for all genetic activities of the cell. Nucleic acids give instructions to cells to produce and allocate organic molecules for specific structures. A cell is made up of organic molecules that are structured to perform a specific function. If there is one basic truth about all living things, it’s this: structure determines function. Natural selection of life occurs because of random mutations in the nucleic acids that call for a differently structured cell based on different allocations of molecules within the cell. Cells that are structured differently can possibly be advantageous for new functions, if they don’t harm the organism. Mutations in the instructions for the structure of cells causes evolution in nature. Without an altered structure, the cell can’t perform the new function. 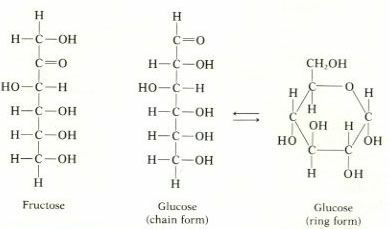 The simplest organic molecules are carbohydrates which are made up of carbon, oxygen, and hydrogen atoms usually in the form of five or six membered rings. Because of carbon’s ability to readily bond, these small molecules can combine to form much longer molecules to be used for energy storage or as structural support. You know carbohydrates by their more common name “sugar,” but it is important not to limit carbohydrates to only what we call sugars. Fiber and starch are two forms of long chain carbohydrates that are found in the reproductive organs of many plants like fruits, wheat, corn, and potatoes. Plants allocate these simple molecules to external structures so animals eat them and distribute their seeds elsewhere when they poop. You know lipids as fats, oils and waxes. Like with all organic molecules, structure determines function. Lipids are more energetically dense than carbohydrates since they have more bonds per molecule. Lipids have a polar head region and several nonpolar tails coming off the head. The polar heads will be attracted to the surrounding polar water while the nonpolar tails will group together to avoid water. This is why water and oil don’t mix and also why micelles and lipid bilayers form spontaneously in water. Your cell membranes are composed of a lipid bilayer to separate the water inside and outside the cell. You know one type of lipid by the name “cholesterol” and it’s one of the most vital molecules in your body. Cholesterol is used in cell membranes as well as many hormones. The reason we worry about our cholesterol levels is because too much in our blood stream could stick together and form a clot, blocking the blood. The majority of your cells and the structures within your cells are made up of proteins. Proteins are chains of amino acids bonded together and folded in energetically stable ways. Proteins consist of upwards of hundreds of bonds each and are the most energetically dense organic molecule. In fact, many of the proteins we eat aren’t even broken down for energy; we redistribute them into our own cells. The structure of a protein determines its function which can range from transporting molecules through a cell to offering support or absorbing light for protection or perception. You find the highest concentrations of organic molecules in muscles since they constantly need energy to allow you to move around. This is why meats contain so much protein and lipids. It’s better for the movement organ to have too much available energy than not enough. Proteins are also allocated toward reproductive organs as a means of sustaining the next generation until birth. Protein heavy eggs, nuts and beans are all examples of how organisms allocate energy for their offspring. Each of your cells is made up of thousands of organic molecules adapted over millions of years to serve a specific purpose for both the cell and overall organism. Each of your cells responds to the exact instructions of its DNA to gain the structure necessary to perform its function. Don’t forget that you exist because of a symbiotic relationship between your DNA and your ribosomes. It allows for a symbiotic relationship between all the cells of your body, which allowed for a symbiotic relationship among our ancestors as they worked together to build a society. All of life as we know it boils down to nothing more than four groups of carbon based molecules working together.